A weather station is a great educational tool that should be an integral part of any school. It can give children a hands-on learning opportunity about the weather and other meteorological concepts that are part of the Earth science curriculum. A general rule is to invest in the best weather station for schools to ensure that generations of students can benefit from the station. But this is easier said than done for many schools. This is why I’ve made a selection of weather stations that can fit any budget and school needs. What is a Weather Station for Schools? The intended purpose might be the only differentiating factor if one is to compare school weather stations to other models. Like all commercial weather stations, the ones for school must be able to take precise measurements of outdoor weather conditions and generate accurate forecasts. In addition, most of the units can pull historical weather data from the Internet which may prove to be an invaluable teaching resource. It should go without saying that connectivity is the feature to look for in order to make the weather stations more interesting for today’s tech-savvy children. What to Consider When Buying a Weather Station for Schools? There are a few things to account for in order to get the best weather station for kids at your school. Unfortunately, the budget is one of the determining factors in the search for a school weather station. The good news is there are more than a few quality weather stations that fall within even the tightest of budgets. 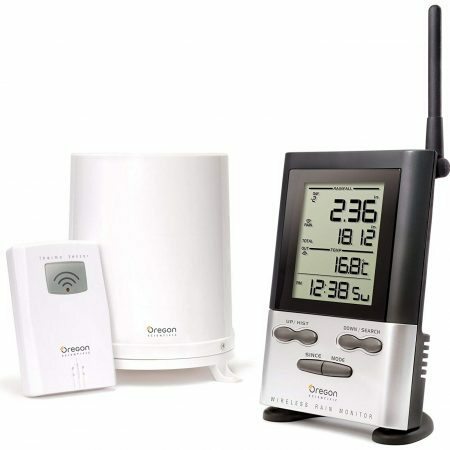 Even if you opt for an entry-level weather station, you’d want to look for internet connectivity and a few other essential features. I can’t stress enough the importance of connectivity for weather stations in this day and age, especially for educational purposes. The accompaniment web-based portals and applications allow the children to actively participate in the weather analysis. Every school weather station should be able to measure indoor and outdoor temperatures, wind speed and direction, and humidity. However, it would be really nice to include UV index and solar radiation as well, particularly if the station is going to be used for Environmental Science classes. And choosing a unit that can measure and record precipitation data wouldn’t hurt either. 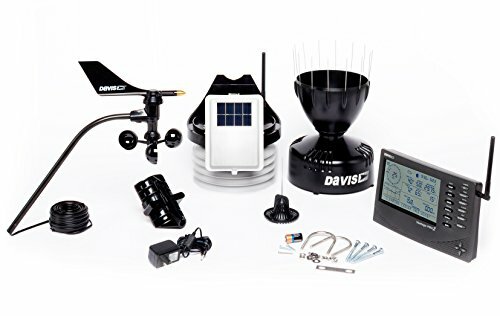 Due to its versatility, build quality, and number of features, the Davis Instruments 6152 Vantage Pro2 may well be the best weather station for schools. This weather station may be pricey, but you’d be investing in the education of future generations since the station is built to last. In terms of measuring capabilities, this weather station has everything a school could ever need. The high-quality sensors measure accurate humidity, temperature, wind, and rainfall. In addition, the 6152 Vantage Pro2 comes with a passive radiation shield. If possible, you should also consider the optional solar radiation and UV sensor. Nevertheless, the base model comes with a 40-ft. anemometer cable which allows you to place the anemometer high up in the air for more accurate wind readings. 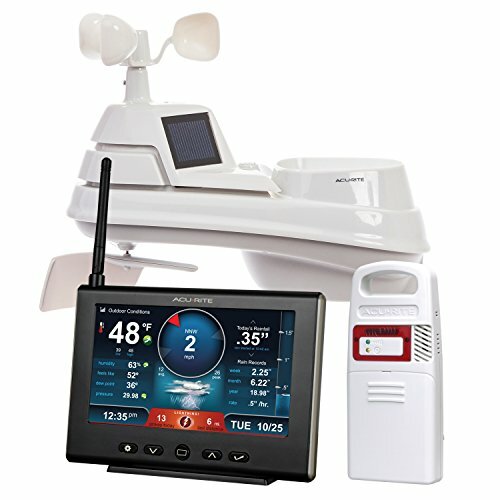 You can hook up the 6152 Vantage Pro2 to a Davis Instruments data logger for the students to preview the weather information on mobile devices or computers. The newly released WeatherLink cloud platform allows easy data storage and retrieval. The combination of great features, an extra lightning detector, and reasonable price makes the AcuRite 01024 Pro the best value for money. This weather station comes with a bunch of sensors and a rather large full-color HD display for easy data reading and manipulation. 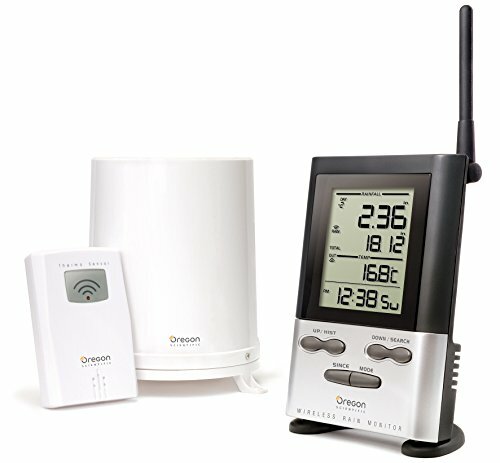 The 01024 Pro is a 5-in-1 wireless weather station which reads humidity, wind speed and direction, temperature, and rain levels. In addition, the software allows you to set programmable alarms for any or all of the measuring parameters. In my view, the alarms are a very cool feature that’s bound to excite the children. On the other hand, the included lightning detector adds extra educational value to this weather station. It helps the children learn about incoming storms first hand by displaying the number and estimated distance of detected lightning strikes. This lightning detector can spot lightning within a 25-mile radius which should be more than enough for educational purposes. Another great thing about this weather station is its ability to keep weather records for a full year; students can easily go back and retrieve seasonal weather changes of note. The Oregon Scientific weather station is an excellent budget option for schools. But don’t let the low price point fool you – this weather station can hold its own against some premium models. First off, it has an excellent 300-feet wireless range. This should be more than enough for all but the largest high schools. The Oregon Scientific is surprisingly accurate for the price, highlighted by a 0.04-inch accuracy when taking rainfall measurements. The unit also features a precision temperature sensor that can transmit data up to 100 ft. On top of that, the base/indoor unit also measures accurate indoor temperature. However, it is worth noting that this weather station reads only temperature and precipitation levels. What the unit lacks in measuring capability it compensates for with its weather data memory. It keeps a nine-day record of cumulative and daily rainfall. All of the records can be easily accessed via the main console. Most contemporary schools would consider a weather station an indispensable tool for environmental and Earth science classes. And as you can see from this write-up, finding the perfect weather station for a school is not that difficult. One model beats out the competition to be the best weather station for schools. The Davis Instruments 6152 Vantage Pro2 is the weather station every school should get. It features premium sensors, durability, and technology to assist in the education of students for generations to come.